GLYNDON, Minn. — A fire destroyed multiple buildings at Andy Lake Woodworks in May. Now a group of Amish workers are bringing out all of their tools to help owners of the business rebuild. Andy Lakes Woodworks has risen from the ashes, and it’s all thanks to the Amish for paying it forward. Six years ago, the business owner Scott Petry helped many of the Amish rebuild their barn, which burned down at Andy’s Lake in Crosslake, Minnesota. Now the Amish are returning the favor, at no charge. “They’re all amazing friends to us and we try to take care of each other so it’s a big blessing,” Petry said. They called Petry’s uncle, Bryan Johnson, to get involved. “They made it perfectly clear. We want to help. We want to be involved,” Johnson said. Glyndon is located just over the North Dakota border, about 10 miles from Fargo. It’s hard to tell where exactly the Amish in this story are from, however. 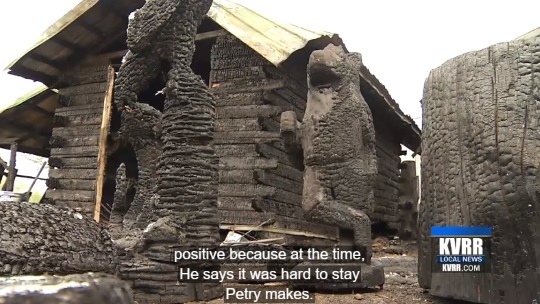 As noted, Petry helped the Amish rebuild a burnt-down barn in the area of Crosslake (Crow Wing County), about 2.5 hours east. I can’t find evidence of a community in the immediate area, though Amish do live in at least two adjacent counties. There’s a video to this story, but it’s not embeddable. I recommend viewing it, which you can do here. In this month of Thanksgiving, I’m thankful for the Amish and anyone else who willingly gives from their heart without seeking recognition. but I do think it is surprising somewhat because I don’t think Amish people blend much with “English” people often. I think they probably do come together within their communities to help people in need as a practice, atleast I can imagine it, I know zero Amish people personally but I admire parts of their lifestyle, especially doing without electricity and tv. I feel “English” people do help one another, maybe not in an organized way but there are many caring souls who do help one another. God bless them! Wonderful story.I am never surprised at the generousity of Amish communities……There is a city in California who had a ginormous fire rage through it. It was Oct.2017. The City is Santa Rosa California. The numbers of homes and businesses has reached about 8,500. You are not reading this amount wrong eight Thousand and five hundred homes destroyed in a raging wildfire storm. I know The Amish could not ever replace this many homes, but was wondering if any would be helping out in California. It was my families home town at one time and entire neighborhoods are gone. Many people lost their lives and are struggling to wrap their heads around how to move forward. I am sure these people will eventually follow the insurances recommendations and get their homes re-built. For Amish to help out everywhere they can is always an inspiration. I, too, wonder what Amish community these Amish builders are from since I wasn’t aware of an Amish community at Crosslake, Mn. I looked at my detailed Minnesota map and saw that there is an Adney Lake near Crosslake,but no Andy Lake, so wonder if the news story has that lake’s name incorrect. I’ll be looking at news from Minn. Amish communities in The Budget newspaper and if I learn anything about this story there, I’ll report it here.